The vortex theorems of Helmholtz are dramatically demonstrated by the formation of huge and very fast smoke rings capable of knocking over a plate or blowing out a candle at a distance of over 5 meters. Rings are produced by striking a stretched rubber sheet on the back of a large box. A cylinder of air comes out of the circular aperture at great speed. A whirl forms at the edge of the discontinuity, becomes independent and moves away. Directions for doing the demo: Give a short but swift punch to the back of the device. 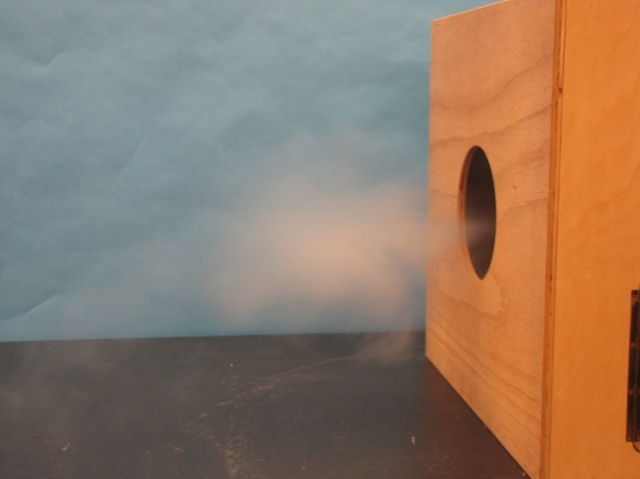 A toroidal vortex will exit the device and as it transverses the room it will take the appearance of a smoke ring. If you want to show the vortex, start by filling the interior pan with a source of smoke (dry ice and water or liquid nitrogen). Place the pan in the device and secure the side door. Now give the blow to the back of the device and watch the smoke ring appear. Suggestions for Presentation: With practice one can snuff out a candle from across the room with these invisible vortices. For added flair, point the box toward the audience and watch hair fly up suddenly on some student's head. Great Entertainment!